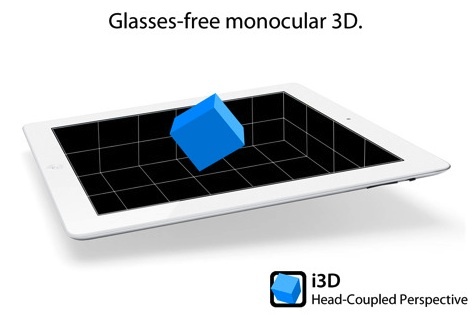 Do you remember the goggle-free 3D graphics iPad 2 demo video? If you don’t, no worries the video is embedded below, but in short, a research team came up with a creative way to mimic 3D graphics on an iPad 2 and iPhone 4 display by utilizing the front facing camera to track the users face and then alter the images on screen to appear as if they’re 3D. Now that same research team has released the free i3D app, so you can see the 3D illusion effect yourself. i3D is clearly just experimental at this point and the app doesn’t do much beyond showing a few sample 3D screens, but from a conceptual standpoint you can see there is a lot of potential with this kind of 3D illusion technology for future apps and games. It’s harder to explain than it is to demonstrate, so watch the video and download the app yourself. The face tracking system does not detect and track the face in every lighting condition. Read the instructions in the app to get a good tracking. Head-Coupled Perspective does not create a stereoscopic display! It provides a kind of monocular 3D display: the same picture is seen by both eyes. In the future, it might be combined with a stereoscopic display for a better 3D effect. i3D has been developed by Jeremie Francone and Laurence Nigay at the Engineering Human-Computer Interaction (EHCI) Research Group of the Grenoble Informatics Laboratory (LIG), University Joseph Fourier (UJF). The video is accurate as to how it works in person, but again if you have an iPhone 4, iPod touch 4th gen, or iPad 2 I would try it out yourself. Showing a static screenshot from one of the five sample scenes shows nothing special. As you can see in the image below, it doesn’t look 3D at all, it needs to be on an active display and aware of where your face is in relation to the camera in order to demonstrate the 3D effect. Heads up to MacStories for letting us know the app is available. i got it on my iTouch 4G, it’s amazing. It’s interesting and certain has some applications. But, to be clear, it is not 3D. If you’ve ever looked at a “3D object” that allows you to spin it around and view it from different angles, that’s all this is. The difference is it uses your front facing camera to change perspective instead of you choosing to spin it. James…your head is 3d your iPad screen can never be. It’s 2d bro. So are all the other types of 3d that you think are “real.” so yes this tech is comparable to the old tech with glasses. Only the viewing angles aren’t as extreme. When was the last time you got up from a 3d movie and tried it from the side? Not a normal move. It does more than just pass as real 3d. Folks in a theater wouldn’t know the difference. This is very fancy, no it’s not “REAL 3D” but it passes well, I hope games use this soon. I tried this on my iPhone4, and maybe something was wrong with the distance I held it or the lighting (though I was in good light) but it was absolutely terrible and did not work at all. Aside from not really being able to find my face and tracking random objects, it was just very slow and laggy. All it does is show a red square around my face. Then the phone locks itself. How do I get it to work? Once the red square has recognized your face, swipe to the right and you’ll see the first of about 5 different variations showing off the 3D effect. You guys do understand that “3D” on a 2demensional plane is an illusion. Hence the funny colors and glasses and overlapped images? Don’t you think it’s a step in the right direction to have the device detect your position and automatically adjust what regular 3d would require special glasses for? Soon enough we will have 200 inch screens with detection for many people or positions as in a movie theater. It will totally rock! Down with 3d glasses! I’m also assuming it would be possible for any mac that has a front facing camera to perform the same function as this i3D app if programmed to run on the Mac OS. Please let me know if this is developed! F*ckin? tremendous issues here. I?m very glad to peer your article. Thank you so much and i am taking a look ahead to touch you. Will you kindly drop me a e-mail?